That's all folks - sorry, we're no longer operating! For many years (2002-2013), Hidden Gambia provided visitors to The Gambia with the opportunity to travel off the beaten track to discover the rich variety of birds, wildlife and people that live along the river banks of this West African country. Vastly more interesting than a hotel-based package holiday and infinitely more relaxed than a "follow-the-leader" style group tour, clients were able to create a customised itinerary based on our unique weekly schedule of boats, vehicles & guides. Accommodation comprised of a hand-picked selection of hotels and eco-lodges - both at the coast and at Bird Safari Camp, the lodge I (Mark Thompson, Hidden Gambia's Managing Director) built 200 miles up-river. Regrettably, in July 2012, the Gambian director of Bird Safari Camp, Alhagie Bithaye (who should own only 3% of the camp) turned up and claimed that the entire business now belonged to him - this despite his own admission that he has never invested any money! Bithaye based this claim on a 2011 court ruling in which it was declared that his removal from the Board of Directors (in 1998, for theft of company property) was null and void because the required 28 days' notice for holding the extraordinary shareholders' meeting had not been given. This requirement was not communicated to the other shareholders by our solicitor at the time. Not that the other 'shareholders' in Bird Safari Camp were in fact legally shareholders... for it transpired, only many years later, that the same solicitor, Bithaye's 'uncle', Lawyer A.N.M. Ousainou Darboe, had failed to register any shares to the non-Gambian investors, despite producing documents signed by Bithaye as Company Secretary - indicating that he had! In July 2013 the investors who had been denied their ownership rights filed a court case against Bithaye and Bird Safari Camp in an effort to get their shares registered. After countless attempts by Bithaye to frustrate the course of justice (e.g. refusing to be served by the court processor; or claiming that the Applicants should have filed their case under a 2013 Companies Act which had not yet been passed, let alone printed...), I learned on 31st May 2017 that the case had been ruled against us! Apparently this ruling was made in September 2016, though I have not yet received a copy. How convenient for Bithaye that no-one at the court informed us of this and that the 3-month period for appealing against the judgment had passed! In the meantime, Bird Safari Camp has all but been destroyed. In the words of one recent visitor, it is now "Dirty, uncared for ...and just a shell. Avoid at all costs". 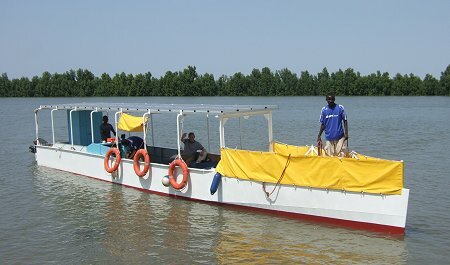 Bithaye has also stolen Hidden Gambia's boats (which were only leased to Bird Safari Camp). Our solar-powered boat - the first in Africa - was impounded in November 2012, simply because Bithaye claimed that it belonged to Bird Safari Camp - and therefore to him! This occurred despite Bithaye's utter lack of evidence to support his claim and in the face of overwhelming evidence against him: original contract documents, receipts, bank statements etc. Amusingly, when I tried to recover the boat, I was charged - and almost prosecuted - for "stealing my own property"! Regrettably, our staff were refused access to replace a faulty bilge pump and in August 2014 the boat filled with rainwater and sank. To date my D5.5 million (approx. €100,000) investment is still at the bottom of the Gambia River, gradually rusting away. I could mention the many hours of questioning I faced by the Banjul fraud squad and the 5 nights in November 2014 when I was held on remand at the infamous Mile 2 prison (with 19 people in a cell built for 6), falsely accused of D6.4 million tax evasion (over £100,000!) - a figure for which the basis of calculation was withheld from me on grounds of "confidentiality" and which was apparently done without the knowledge of senior staff at the Gambia Revenue Authority... But these are memories I'd rather forget. In April 2013, I suspended Hidden Gambia's operations and in September 2016, I closed the company down permanently. 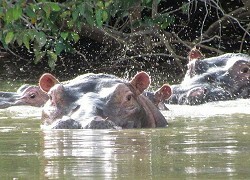 Having spent the best part of 20 years helping to develop tourism in The Gambia, I have now moved on to other projects. My thoughts, however, remain with the former staff of Bird Safari Camp and the many other Gambians and their families that we (and you!) supported through Hidden Gambia, some of whom have since risked their lives to travel to Europe in search of a better life. Fax sent by Bithaye on 7th September 1998 in which he admits that he has not invested any money in Bird Safari Camp and begs for mercy 'for the final time' following the discovery that he has stolen a number of items of company property. The treatment he refers to is for a 'mental disorder' which was just another ruse by which he extracted money from well-meaning, foreign investors. Oh - and his mother never did sell her house; there was never any intention of that!! Hidden Gambia Holidays Ltd. once was a UK registered company No. 4459040, but alas, it is no more!